In formation: The olloclip lens and Shapeways products. A ball. A cup. A gear. Even an electric car. 3-D printers can't print money, but they can produce prototypes for almost anything else. And as prices for the desktop devices drop, entrepreneurs are seeing them kick out something more: tangible business results. 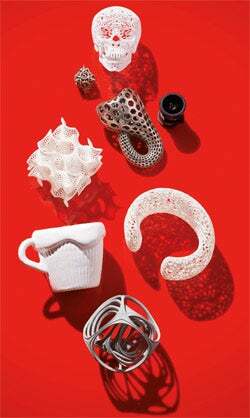 3-D printing, also known as additive manufacturing, uses technology born of paper printing. But rather than outputting two-dimensional renderings, it makes actual physical objects. There are a few methods. Fused deposition modeling printers push heated material through a tube (much like inkjets), "printing" objects in three dimensions, one layer at a time. Selective laser sintering (SLS) units, meanwhile, operate like laser printers, shining a high-powered beam of light onto a bed of powdered resin, turning it into a hardened material. And stereolithography works similarly to SLS, but with liquid resin. "There are a ton of companies, from one- and two-person organizations to sub-100-person organizations, that actually make themselves competitive with the 10,000-pound gorilla in their particular marketplace because of the advantages they get with 3-D printing," says Bruce Bradshaw, marketing director of Objet, a 3-D printing provider based in Israel that was merging with Eden Prairie, Minn.-based Stratasys at press time. He says Objet's annual revenue has grown 35 percent over the past three years, driven largely by small- and medium-size business customers. Meanwhile, the average cost of basic 3-D printers has fallen from $200,000 to $15,000. Huntington Beach, Calif.-based company olloclip has used 3-D printing to make a big name for itself with its little iPhone accessory. The snap-on camera lens has garnered rave reviews and is one of the few peripherals stocked in every Apple Store (not to mention Best Buy and Target). "I can't imagine doing this without owning our own 3-D printer," says CEO Patrick O'Neill. Olloclip has invested $50,000 in 3-D printing, not only to prototype its own products, but also to create mock-ups of rumored iPhones so that lenses can be designed quickly each time Apple releases a new version. "We can literally sketch an idea in the morning, model it in the afternoon, pop it in the printer and have a sample made that evening," says olloclip design director Chong Pak. Fast turnaround is key for companies in this space; olloclip finished and validated an iPhone 5 version of its product within days of the handset's announcement. But olloclip's biggest challenge is in fending off counterfeiters in China. Poorly made fake olloclips flood Asian markets. Thanks to 3-D printing, olloclip can keep its computer-aided design files in-house and safe, rather than having samples produced through rapid prototyping service bureaus, which have been known to leak blueprints. "You hope that the people you send the files to are ethical, but you just don't know," O'Neill says. "If you keep it in-house, you don't have to worry about that." The efficiency of 3-D printing has transformed business for Houston-based ClearCorrect, a maker of invisible braces. Previously it used milling machines to make models of customers' teeth that were thermoformed with a thin, clear plastic to make braces. Only one model could be made before resetting the expensive, high-powered machinery, which often broke down. With 3-D printing, CEO Jarrett Pumphrey discovered, they could run batches of 60 to 70 models at once, taking five minutes each, vs. 13 minutes with milling. The 130-person company expected a 30 percent sales gain for 2012 and is now using only 4,000 square feet of its facility and three to four people to produce models, rather than the 11,000 square feet and 10 to 15 people needed with the milling machines. Still, investing in 3-D printing isn't for everyone. That's where providers like New York City-based Shapeways come in. It offers 3-D printing in more than 30 materials--including plastic, glass, metal and ceramic--and an online marketplace where anyone can sell products. It offers 8,000 shop owners a low barrier to entry by charging only for materials used in production, plus a 3.5 percent transaction fee. Clients include designers of jewelry, tech gadgets and housewares; Shapeways enables them to produce and sell their creations in limited numbers but in a cost-effective way. "Our value proposition," says director of marketing Carine Carmy, "is that we can offer the price and quality of what you can buy in a store, and have that still be custom."